This year I decided to incorporate more live plants into my Holiday decor. I usually lean towards a classic theme and I had a feeling that live succulents would complement that kind of style… I was right! 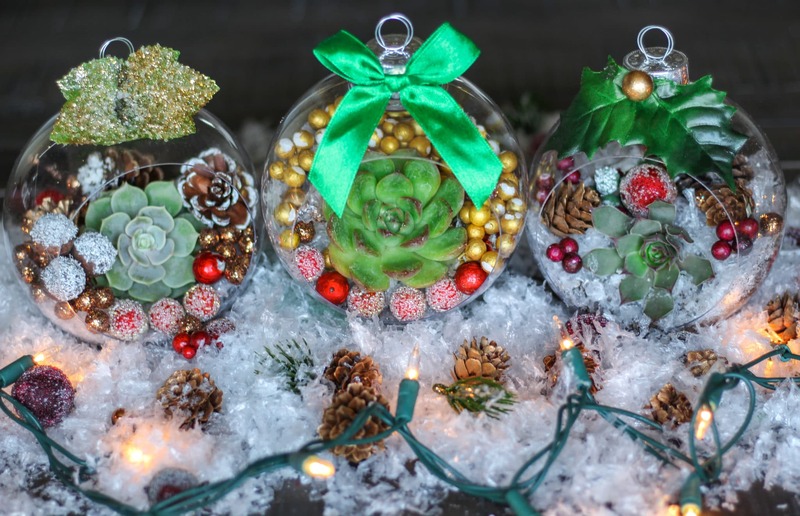 I loved making these adorable succulent ornaments for my Christmas tree so much and that’s how this succulent table centerpiece came to be. What Kind of Succulents Can You Use? 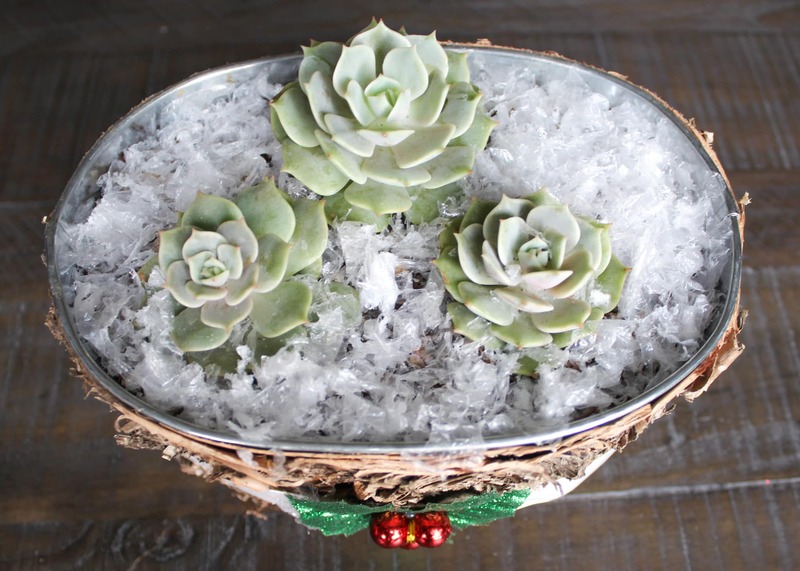 You can use your favorite succulents or whatever you have on hand – you can even mix succulents and cacti for this craft! I love Echevarrias Lolas because they have a rosette shape and subtle coloring, so they can easily be worked into many different types of crafts. One of the advantages of growing succulents is that you can use them as decor for both indoor and outdoor projects without hurting the plant. 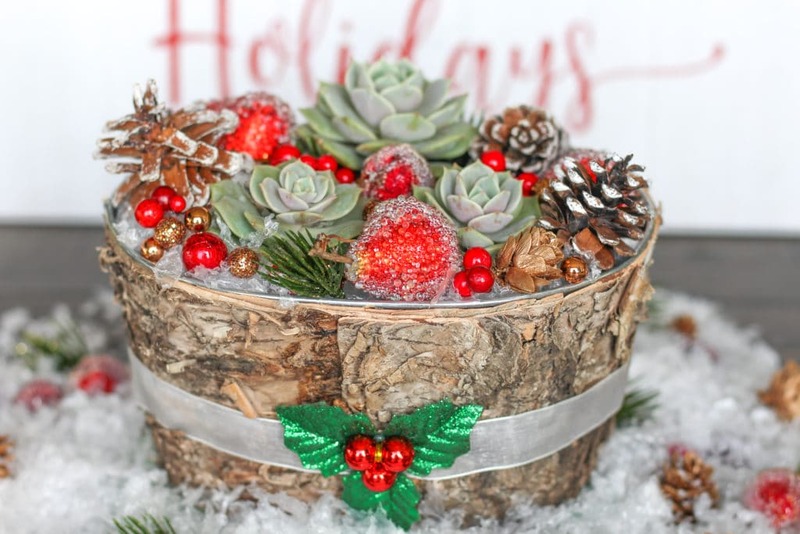 Because they’re so sturdy, hardy, and drought tolerant, succulents can adapt to new surroundings and can be replanted or propagated once you want to take down the craft, or in this case, once the Holiday season is over. 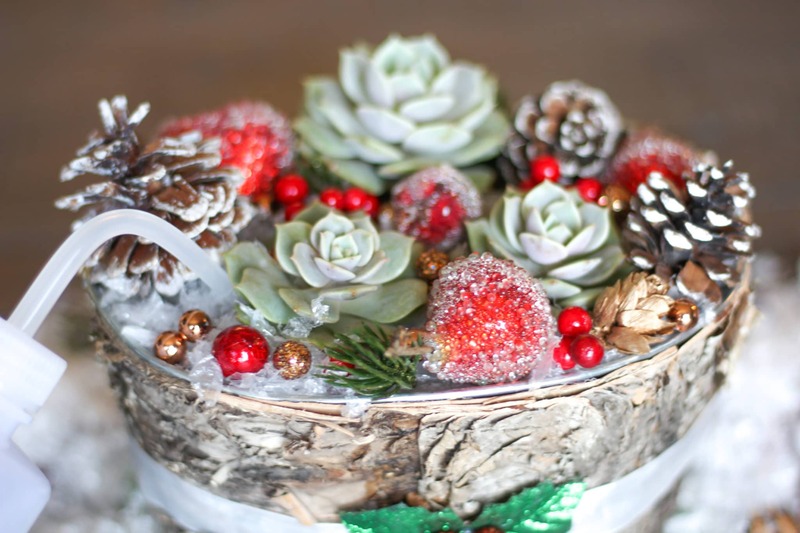 This centerpiece is my favorite succulent craft to date and it was SO easy to create. The light jade shade of the Echevarrias against the pops of red and the brown wood shavings really give my dining room that Christmas-y feel I was going for. Once I was done making the centerpiece, I simply placed artificial snow on the dining table around the centerpiece, along with some pretty __ . This craft only took a few minutes to make and you know what the best thing about it is? I now have a beautiful DIY table centerpiece to enjoy throughout the season and on Christmas Day when my husband’s family comes over. It’s one less thing to worry about during the busy Holiday season! my mom got me from Michaels because I think it’s the perfect size for a table centerpiece: it’s not tall so it won’t obstruct anyone’s view when they’re sitting down to eat dinner (my pet peeve!). The container goes well with our dark dining table and the wood shavings give it a nice texture and makes the perfect canvas for pops of red, white, and green. 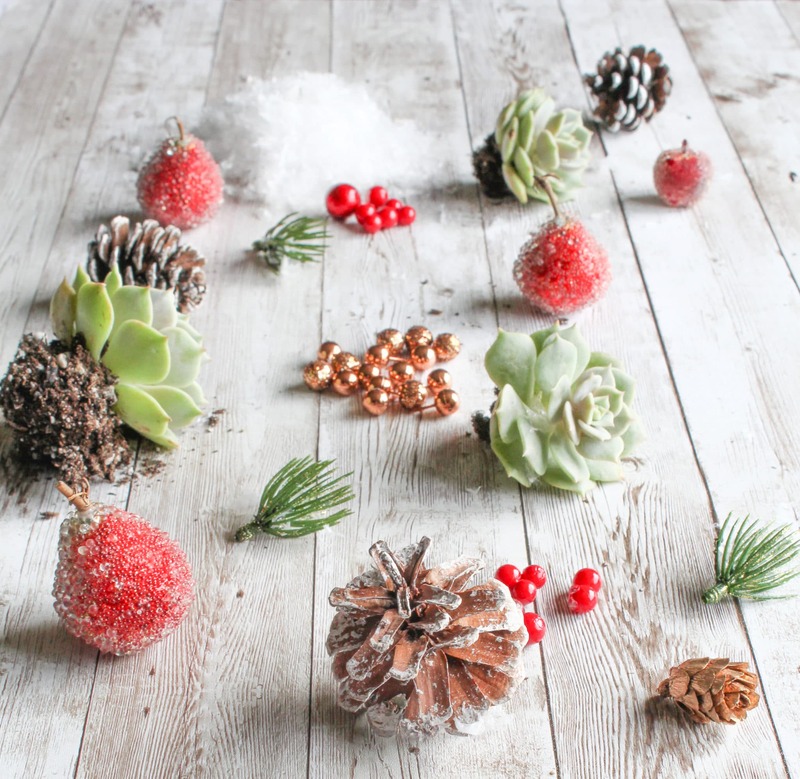 I love the look of frosted pinecones and use it throughout my Holiday decor, so I knew I had to incorporate a few of them into this centerpiece, along with some artificial snow and little red beads. The red beads actually come from some cranberry and floral picks I got at a craft store. They inexpensive, so I simply tore the off round beads. I love red in Christmas decor, but you can use whatever color you prefer – gold, silver, green, etc. To add a more festive element to the centerpiece, I tied sheer ivory ribbon around the container, and used my hot glue gun to glue on a floral decoration I had with 3 leaves and 3 beads. I think it completes the look really well!
. Using cactus mix is a must! Regular potting soil retains too much moisture and is not ideal for succulents because excess water will cause them to rot. Since this container does not contain a drainage hole, it makes using cactus mix all the more crucial. Using your hands or a spoon, make 3 small holes in the cactus mix wherever you want your succulents to go. I created one hole (or pit) in the top center of the container and two holes on the sides below it. so that the succulents are sitting atop the soil, as shown below.
. The snow is what gives this craft that gorgeous Winter-Wonderful look! Make sure to cover as much of the soil with snow, and carefully place it around the succulents, not on. , and place them on top of the snow and around the succulents. Voila! 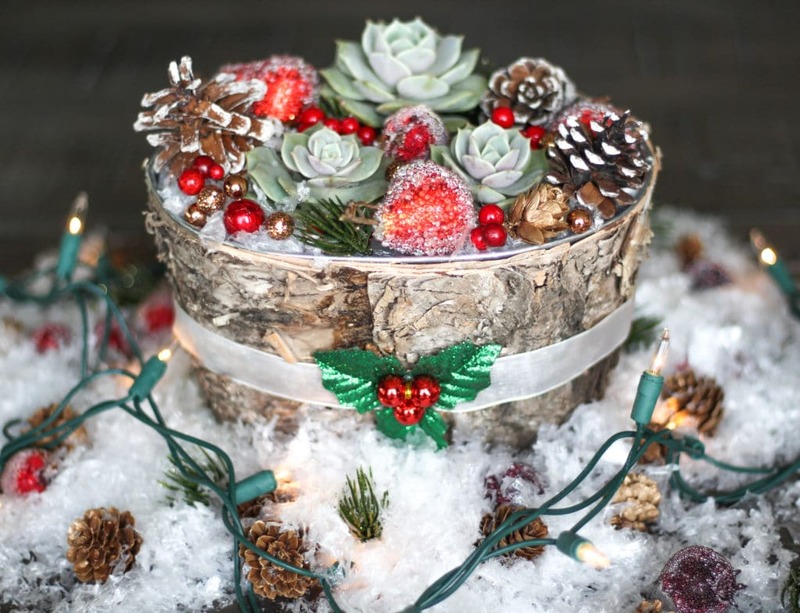 You now have a beautiful Christmas centerpiece with live plants! 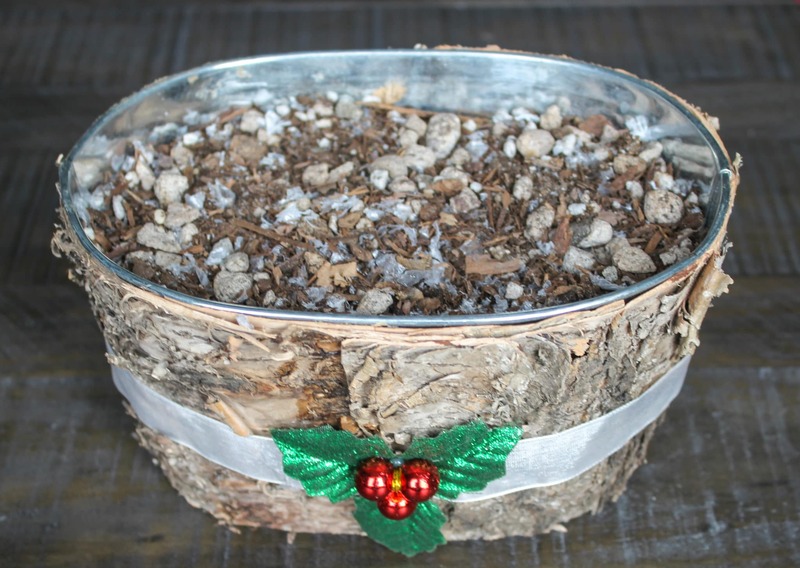 I tied some ribbon around my container – it’s all in the details! I used sheer ribbon and then glued some a decorative floral piece to it. It pulled the entire craft together so seamlessly! Make sure to read how to water this beauty, below, especially if you’re using a container without drainage holes. This container does not have a drainage hole, which means I need to be very mindful of how I water my succulents. I can’t water it too often and when I do water, I can’t water deeply. I can only use small amounts of water each time to make sure that the soil isn’t overly moist or sitting at the bottom of the container. Succulents, especially Echevarria Lolas, may rot if overwatered. (Learn more about the importance of watering succulents the right way, here). A few small squeezes of your watering bottle is all you’ll need! For more about Succulents, check out the posts, below!